Arsenal youngster Chuba Akpom is set to sign for Championship side Nottingham Forrest on loan this week until the end of the season. 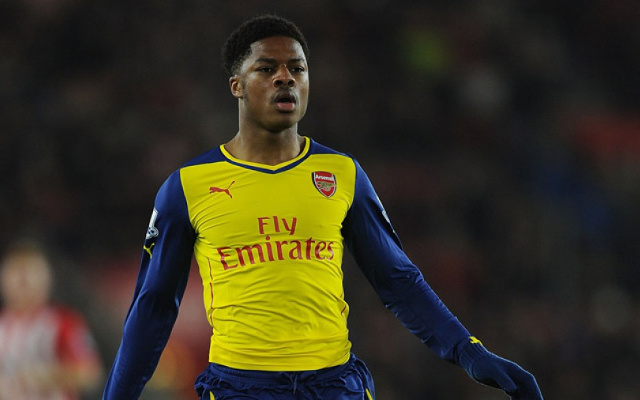 Akpom, 19, is seen as the next major talent to come out of the Arsenal youth ranks and the club wanted a loan to continue his rapid progression after a series of appearances for the first team this season. Forest were one of seven sides in the English second-tier chasing the teenager before the Championship loan-window closed this week but the Gunners were convinced Dougie Freedman’s side could off Akpom the most game time and were the best fit, reports Daily Mirror. The teenager only recently signed a new four-and-a-half year contract to keep him at the Emirates until 2019 after fears he could leave in the summer after knocking back several attempts to negotiate an extension. It appeared the England Under-20 striker required assurances over his prospects and potential game-time which he eventually got after Arsene Wenger sent both Lukas Podolski and Yaya Sanogo out on their own loans to move Akpom right up the pecking order. The Arsenal youth teamer has made seven appearances for his side this season and with the return of Theo Walcott to fitness hamstringing his game-time a loan move seems the best option to provide him with regular, competitive football.